This exceptionally well-chosen show revealed, in just nine images, how wonderfully flexible Fairfield Porter's style could be. While never diverging from the figurative, these works, dating from the early 1950s to the mid-70's, showed the agility with which Porter balanced his depictions of people and places with his emphasis on the paint itself. 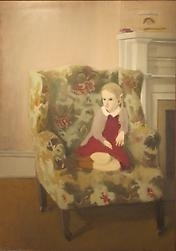 In Katie on an Armchair (1954), Porter's somber-looking daughter sits curled up in a floral-print chair, which, like the mantel behind it, is meticulously rendrered. But Katie's face, limbs, and sweater are delineated in flat, rough strokes. The girl's small dark eyes seem to peer from behind the thickly painted surface of her face, almost as if she were wearing a mask. For Under the Elms (ca. 1970), by contrast, Porter used the same flat style to describe his son, but instead of placing him in a realisitically rendered scene, he put him in a landscape patterned by shades of green jostling against one another, in order to represent the effect of sunlight and shadow on a lawn. Figure and background merge here as they do not in the earlier painting, and the result is close to abstraction. How light affects perception was also a theme in this show. The small paintings View from Bear Island (1968) and Bear Island with Spruces (1974) differ in tonality, with paler shades in the earlier painting having an impressionistic feel, while darker tones in the later work bring the contours of the landscape into sharper focus. But most impressive was the overall sense of unity here. Porter, who wrpte for this magazine in the '50s, had a broad knowledge of art. This small smapling demonstrated how his choice of subject matter, his way of framing an image, and his unerring clarity yielded a varied yet consistently rich body of work.